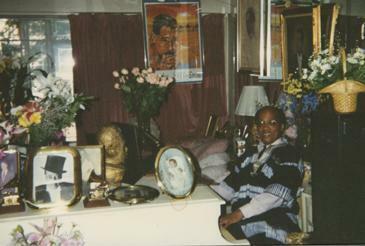 I first met Ruth in her home at 333 Riverside Drive, New York City, in 1974. She had heard that her brother had chosen me to conduct my own music, leading his orchestra in an outdoor performance at Disneyland, in California (1973). The meeting was a wonder to me, because I still did not understand what had happened in that experience with Mr. Ellington and his orchestra. A beautiful, elegantly-appointed town house, her home had been Duke’s residence. From the very beginning of our long friendship, she helped me to understand. 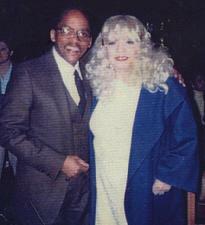 That one meeting with her helped me to focus, and to gain insight into the initial calling that had led me to maestro Ellington and his orchestra (see My Concerto Grosso Orchestration of Duke Ellington's "Black, Brown and Beige"). Randall and Ruth at the National Cathedral, Washington D.C.
About ten years passed, during which time I did not see Ruth. Books, essays, papers, conferences, media stories and other evaluations were written or presented by scholars and other commentators. I made an effort to absorb this information, and tried to further understand my own 1973 experience. In (or about) 1983, Ruth appointed me to lead her brother’s Sacred Music. I was in the east to visit my family, stopped in New York, called her and responded to her invitation to lunch at her Park Avenue home. That is where she would guide and mentor me whenever I visited New York. We shared very similar religious beliefs and it was through these beliefs that she nurtured my understanding. Sunday soirees were important in her social life during the years that I visited her. Between my cross-country trips for some of her birthdays (July 2nd), visits to clubs with her husband, McHenry Boatwright, the Tavern of the Green (our favorite) and the Sunday gatherings, I enjoyed meeting her friends at these Sunday gatherings, more than anything else. She would help me to anticipate future experiences in meeting the demands of working and living in New York. Duke Ellington Society members, producers, Broadway luminaries, artists, etc., became acquaintances with whom I later had contact through my Ellington-related responsibilities. Obviously, I became friends with her family. 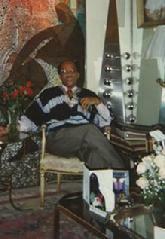 Her son, the late Michael James, was the Ellington encyclopedia-philosopher. I would (be forced to!) sit up all night in his midtown-Manhattan apartment watching one-of-a-kind videos and getting schooling that no university could provide. (!) We had street smarts in common and had many laughs together. I miss him. Stephen James, the suave, sophisticated, worldly son, honored me by inviting me to speak and perform at St. Peter’s Church for Michael’s memorial service. Stephen James is also a family protector of his uncle’s royalty. The relationship with Ruth was briefly estranged in the mid-1990’s, but was renewed quickly. I would always secure her authority and approval when I produced and musically directed the Sacred Music for her around the country. 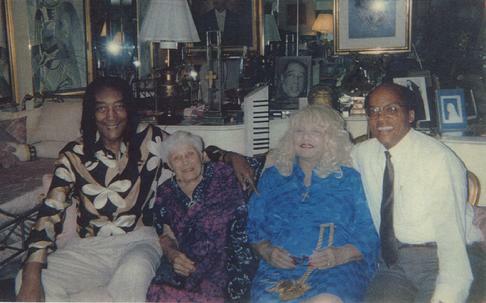 Douglas Fairbanks Jr., the Alvin Ailey dancers, Savion Glover and Milt Grayson were great to work with when she brought me to NYC to conduct the music in 1987 at St. Bartholomew’s Church. Meeting Mercedes then (she was the very young Savion’s mentor) was the highlight for me at the concert. Mercedes Ellington is a jewel and a great creative talent. In her last years, especially after McHenry died, Ruth’s health gradually faded. She had often implored me to move to NYC. My wife, Andrea, and I finally moved to New York in 2003. Michael and Stephen privileged me to visit Ruth at her home and when she was hospitalized. Because she had such a spiritual force and guide as I presented the Sacred Music through the years, I would sing selections from this beautiful music to her during these visits. She had been my spiritual guide for 20 years. She passed away in spring 2004, just weeks before I produced and musically directed a Sacred Music concert at St. Peter’s Church, Manhattan in her honor (a co-presentation of The Duke Ellington Society—TDES—, the Juilliard School, and the American Composers Orchestra). Duke Ellington chose me, but it was Ruth who opened the door. I am eternally grateful to Ruth Ellington. I hope that the general public will eventually know her story, and how great and precious a woman she was. Her brother’s legacy was her family’s mission. She championed his genius and his contribution. I thank God for her ministry to my life.